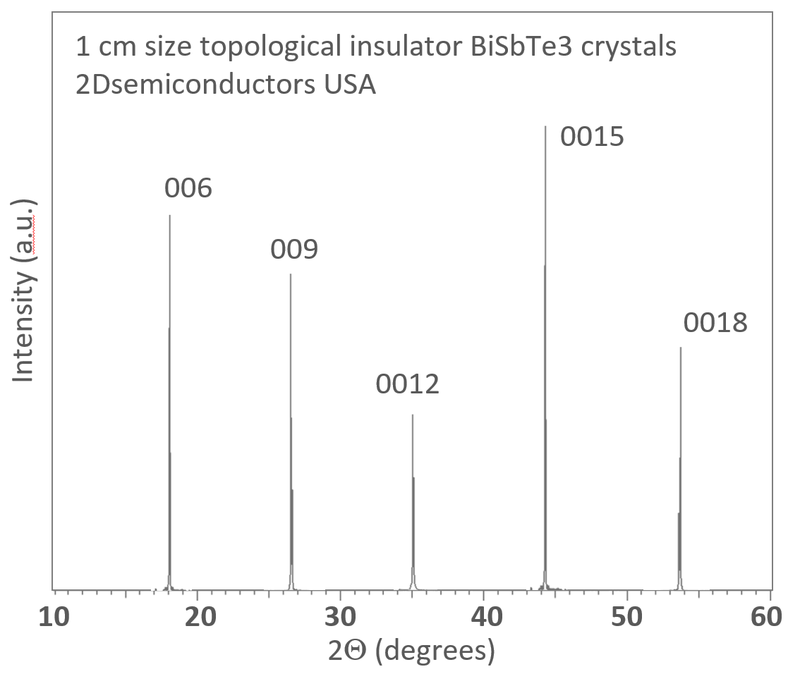 BiSbTe3 is a layered topological insulator material belonging to Bi2Te3 and Sb2Te3 proto-type material systems. Each layer consists of BiSbTe3 sheets weakly interacting through van der Waals (vdW) interactions. Explicit chemical formula can be written as Bi1-xSbxTe3 where x=0.5. Similar to Bi2Te3 and Sb2Te3 crystals BiSbTe3 crystals also exhibit topological behavior and is also known for its high thermoelectric efficiency. Our crystals are grown by flux transport technique at low pressures and high temperatures over 2 months to ensure high purity (99.9995% or higher), high crystallity (sharp and clean Raman and XRD peaks). BiSbTe3 crystals measure nearly 1 cm in size perfectly oriented along 0001 (c-axis) direction and thus it is ready for exfoliation and very easy to exfoliate. Sharp and discrete XRD peaks clearly show high crystallinity of BiSbTe3 crystals. (00l) reflections all belong to BiSbTe3 trigonal phase, there is no minority phases present in our crystals.